We give educators a basis for teaching a fun, easy-to-learn lifetime sport to our youth. Welcome to the home of EDGE, the Educational Disc Golf Experience. EDGE was developed by a group of World Champion disc golfers and subject matter experts to give educators and youth organization leaders the tools for teaching a fun, easy-to-learn lifetime sport to young people. EDGE also links classroom subjects such as math, science, and civics to the sport, bringing those subjects into situations that will make learning come alive. According to the Centers for Disease Control and Prevention, the incidence of obesity among children has more than tripled in the last 30 years. Data from the most recent National Health and Nutrition Examination Survey (NHANES) indicates that 18.8% of children 6 to 11 years of age and 17.4% of children 12 to 19 years old are overweight1. In order to fight obesity, we need to teach children lifetime activities that they will enjoy. We believe that disc golf is an activity that will help in the battle against obesity. Find information below on a Western Carolina University Research project which provides data on the number of steps a player may take in a normal round of disc golf. The number of steps recommended each day for an active lifestyle is 10,000. Disc Golf can easily help to achieve that goal. 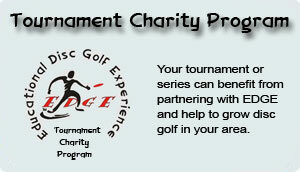 Please fill out an information request form in order to receive more information about EDGE.